Most of you probably already know that my blog post, “Humans Are Willfully Destroying Our Bird TV!,” is one of the finalists for the Petties Best Blog Post category. I got in the finals purely because so many of you readers so diligently nominated me every day, and I thank you so much for supporting me. But you may have also noticed that I have done very little to promote the Petties or ask for votes. I apologize for that. I feel like I am letting you all down after you worked so hard on my behalf. I owe you an explanation. When I saw who the other finalists were for Best Blog Post, it was pretty clear to me that there was no way I was going to win this… and even if I did, frankly, I thought at least two of the posts were better than mine and deserved to win more. I’d already read the Tiniest Tiger post about Gracie and the Covered in Cat Hair post about Fred, and was very moved by them. These are beautiful, heartfelt posts about beloved cats who died. In addition, both these blogs have readerships and Facebook pages that are quite a big larger than mine. I hadn’t read the River Front Cats post yet, so I went over and looked at it… and it was another beautiful, heartfelt post about a beloved cat who died — and River Front Cats supports feral cats, which is the same basic cause behind my own blog post. Sure, I could put all my energy and free time behind my blog post and fight tooth and claw to win this… and maybe I would. But at what cost? My blogging would suffer because I’d be so busy trying to win and projects that my human and I are trying to get off the ground right now would have to fall by the wayside. It happens every time I am in a competition, and I don’t want this to happen anymore. I think I can do more for cat rescues, and better by cat causes in general, by focusing on projects where I know there will be a return on effort. As a result, I have been reminding readers to vote on Facebook and Twitter on rare, random occasions, but I just don’t have the time or desire for a big campaign this time. I decided against having you guys help me pick a rescue because why get anyone’s hopes up? In the off chance that I do win this, I’ll donate the money to an awesome local rescue called Kitty Bungalow Charm School for Wayward Cats — they rescue and rehab feral kittens so that they can be given good homes. My human’s birthday is this weekend and we are going to have a commenthon for them. So I am sorry I am not promoting the Petties this year. If you want to vote — for me or anyone else — click here. You can use your email address to log in if the Facebook login is not working. In the meantime, I am working on a special project that I hope some of you will be a part of, and I will be announcing it next week. Well, we’ve been voting for you, even though you haven’t been actively campaigning. We definitely hear what you are saying. Sparkle, your reasons sounds furry reasonable ! I wish cats could vote Sparkle! Trust us, in our house that would put you on top…but in the meantime the human in the house votes for you! Thanks for all you do for cats and we love reading your blog…contest or no contest! Hi Sparkle! This is Christine on behalf of Riverfront Cats–one of your competitors for Petties. Yes, no fun competing against friends, but you still have a better chance than us as you have long-time loyal following. And you’re also incredibly talented. We’re the little engine that could–our first time being nominated. We’re campaigning, trying to win and that’s all we can do. Not expecting to win compared to you and the others and that’s OK! In the end we all are making a difference in the lives of cats and that’s what matters! Have a wonderful weekend and Happy Birthday to your human! Sparkle, you just gave us one more reason to love you and your human. We want to wish your human a Happy Birthday, too. Our meowma’s birthday is next Tuesday. We would tell you how “mature” she is but she would not give us anymore treats…….ever. Well, you’re a winner to us, Sparkle! We tend not to try and vote much these days as too many of those things are for Americans only. US people, we mean. Funny thing, considering the Net is global. Sparkle, you ARE indeed a class act and there is a good reason I get here most days to read your blog. That is because I think highly of you. This blog shows one of the reasons why. Sparkle, as beginner bloggers Mum and I are learning just how much darned hard work goes into a blog of high quality = YOURS. We totally respect your decision and your feelings. Yes, there are good blog posts – yes competition is tough BUT we KNOW how good you are, we KNOW how hard you work, we KNOW that you make a difference, on a small one to one level as much as on the bigger canvas that is the cat blogosphere. We are with you Sparkle, wherever you go. We understand, Sparkle. We really do. But we do think your post is just as good as the ones by the other finalists. We’ll see you at your commentathon! We know that whomever wins the money will go to an excellent cause. We think that your nominated post is terrific! 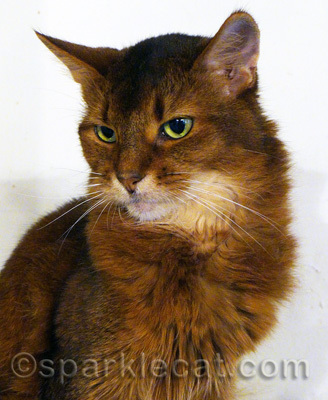 Sparkle, you are a wise cat and we admired you very much! Good luck with your new project! We will always suppost you Sparkle and all that you do. We have been voting fatithfully because your work is always top notch! Sparkle I can understand. It is hard for me on some as more than one of my favorite bloggers are against each other. Can’t wait to find out what else you are doing. We’re not familiar with the Petties and all that voting stuff but we read this post and thought it was wise of you to set your priorities and focus your energies on the things that are most important to you. You’re a class act Sparkle. Well Sparkle, we vote for you everyday because we really don’t know the other kitties. You are a true Ladycat role model for me, Sparkle. There are two of three of you in the cat blogosphere and you’re definitely the kindest one! That was a really nice post. I also wanted to thank you for your birthday wishes for my purrthday, on Texas’ blog. I know I am terribly terribly late, and I apologize and so I send you plenty of purrs and some silky fur of mine! I unnderstand what you mean about begging for votes. In a perfect world, we wouldn’t have to. In the grand scheme of things, why do we have to vote at all since everyone is winning for a charity? I am so over these contests. Bah! Oh, Happy Birthday to your human. 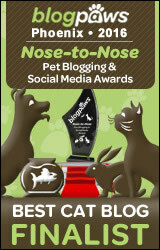 I have been splitting my votes between all 4 nominees in Best Blog Post. I follow all four and was sort of disappointed that I would have to choose one over the others. This is why you are top cat! Your mom has so much grace, integrity, class, sincerity…need I go on. Only if they add those in as a category next year, and only if you are the only one in it, I will vote for you then. Robin’s post on Dear Fred is her heart on her sleeve moving best (though I nominated her post Letters to the one she couldn’t save.) Gracey’s post was also moving. I follow all 3 of your blogs (and am now following Riverfront Cats.) Frankly I thought your post was outstanding!! It is the best answer to the birders and summed up the whole debate and is a great example of what a “best blog post” should be. So I’m splitting my votes – because I think your post should win – but I really want to see KA get the money. Our human says she completely understands, and the one thing that’s so difficult about these awards is that so very many of them are deserving! She cried when reading about Fred, and about Gracie too. We feel a bit ambivalent about the whole thing for those very same reasons, and would probably have done the same as you if we had been nominated. But to us, you’re a stellar blogger. We loved your nominated post every bit as much as the others. You’re a star in our book! Sparkle, no matter what, you’re always a winner with us! 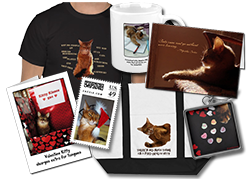 We think you and your human do wonderful work for kitties and win or lose, a contest won’t change how pawesome you are! We think you are being very big-hearted, Sparkle, and magnanimity is the sign of truly great beings. We are full of admiration. yet in de end, after de votes haz been counted; and de prizes haz been awarded; de most important votes come knot onlee frum thoze who reed yur blog everee day…. but frum de three most important votes oh all…. pea ess…kitty bungalow charm school is rockin 🙂 !! We completely understand, Sparkle. It’s very hard to ask for votes. On the one hand, some people like the daily reminders. On the other, they can be a bit much. But when you’re competing against friends, it’s just no fun at all. It’s a huge honor to even be nominated. We were blown away, that’s for sure. Unlike you, we are not up against any of our friends in our category. (phew!) So we are trying hard to win the donation for our awesome hometown shelter. If we win, it will be for them. Not for us. We’ll be sure to come by for your commentathon! Sparkle…if there was a nomination for Ms. Congeniality you’d win!! You are ALWAYS a winner to us. We don’t need no awards to tell us THAT! Sometimes one must pick & choose and your reasoning is sound. I’d still totally vote for you though my furriend. PS – Excited about your project! We so appreciate your opinion about the other good posts and also really appreciate you putting your efforts into helping animals find homes. You always have done a great job at that. It is hard to beat a post about a cat that went through everything that Fred did. But we agree that your post is just as good as any of the others. Take care. Sparkle, voting is hard because we know and love so many of the nominees…’specially when they are up against each other. Your blog post is very good…as good as the others. Good luck! We’ve been voting fur you everyday!!! But you’ve set good priorities! No reason to be sorry you’re not promoting the Petties. You’re no less deserving this year than any other. Honestly, it’s kind of refreshing to not be asked for a vote every time we turn around. We do vote, but it’s overwhelming when it feels like everybody is asking constantly. We appreciate your approach this year. And we are super-curious about your upcoming project! While we can understand and appreciate your sentiments, we still think you should win! Sparkle, we do not know the other bloggers as well as you and we have been voting for you whever we remember to go and vote. Maybe you will win, maybe not, but we think you have taken a good approach. You’re super cat in our books!!! Sparkle, your reasons sound reasonable.